What do you think will change the legal profession most over the next decade? This question was put to an audience of students in a poll during last week’s Legal Cheek ‘Inside Track’ commercial awareness event with BPP University Law School in Cambridge. Could it be competition from the Big Four? Or THAT ‘B-word’ and the rise of populist politics? Perhaps it’s the new solicitor super-exam that will shake up the profession? How about flexible working arrangements or even new Generation Z priorities? Not quite. Technology got the winning vote with a whopping 53% of students backing the so-called digital revolution. But before we swap boardrooms for webinars, what did the panel of City lawyers make of the result? On hand to discuss all-things-tech, one of the central themes of the evening, was Roy Pearce, a corporate finance partner at Baker McKenzie; Andrew Block, a pensions partner at Mayer Brown; Nick Finlayson-Brown, a real estate partner at Mills & Reeve; and Ralph Goodchild, an associate in the construction and international arbitration group at White & Case. They were joined by Julie Manson, lecturer and lead designer at BPP University Law School. Together, they considered the impact of technology on their respective practice areas and gave their views on what this change means for lawyers of the future. Kicking off the discussion, which took place in BPP University Law School’s Cambridge campus, was Mills & Reeve’s Finlayson-Brown. How have artificial intelligence (AI) tools transformed his practice? “A lot of law firms are using artificial intelligence. My team certainly use it for due diligence when checking lease portfolios, while the litigation team use it for e-disclosure… our clients are aware of the benefits and seeing a reduction in price as a result,” he said. It seems AI-based legal solutions are growing in popularity among corporate firms. The IT team at Mills & Reeve is integral to the pitch process for client work, said Cambridge office head Finlayson-Brown. “They’re involved in nine out of ten pitches,” he told the audience. Manson explained that BPP University Law School is embracing tech, too. Her team has been designing programmes and developing apps that will deliver learning to tech-savvy millennials, when and how they want to access it. BPP addresses this knowledge gap in the design of its Legal Practice Course (LPC). Aspiring solicitors are taught the principles of law and legal practice, as well as how to understand how tech can be used in modern law firms, with its new legal innovation and design module. This helps them prepare for the conversations they will have with clients, explained Manson. So it seems lawtech is here to stay. But what role will trainees of the future fulfil? But does this mean the next generation of lawyers will miss out on the opportunity to cut their teeth on basic legal tasks? “For AI to work you need to understand what you’re dealing with. AI may take away the grunt work, but that’s often how a trainee will understand the basics,” said Finlayson-Brown, who spent six months sitting in a basement going through 1,100 property deeds as a trainee. “It was incredibly boring but I learnt more about leases that is still with me today,” he quipped. Pearce pointed to the annotation of prospectuses in finance which is “a repetitive, rule-based task involving tick boxes and checklists that can be outsourced”. But, he noted, much unlike his generation of lawyers, trainees coming through the ranks will not have the experience of getting to grips with the rules. 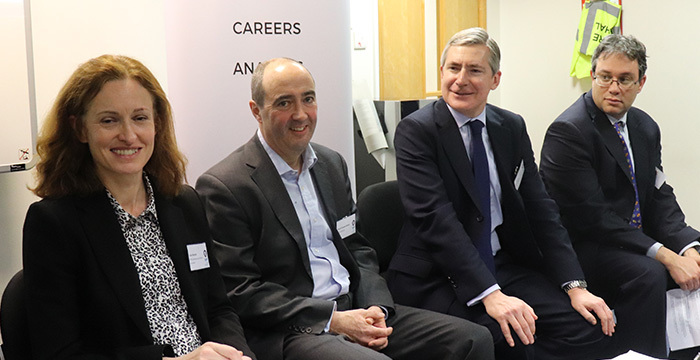 “Law firms do need to make sure that in this drive towards automation trainees don’t miss out on basic knowledge,” he warned.